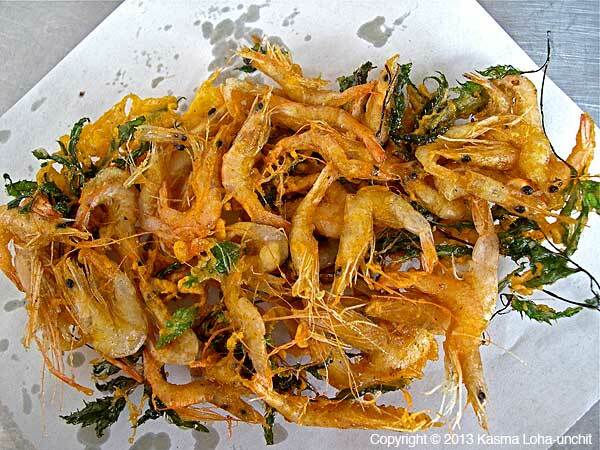 Fried foods are found all over Thailand – as street food and in restaurants – in great variety and abundance. 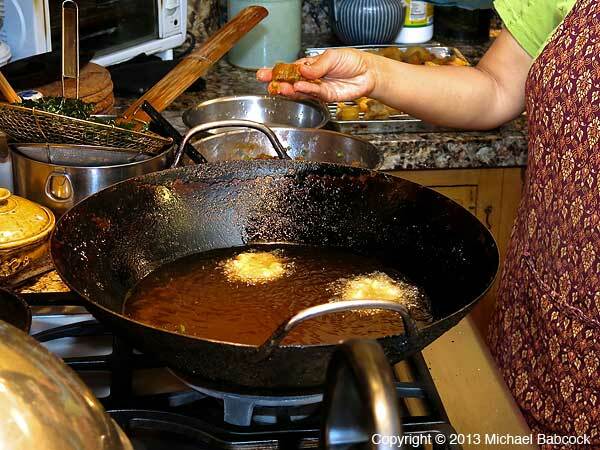 One of my first impressions traveling in Thailand over 2 decades ago was how skillful Thais are at frying food and how popular fried foods seem to be. 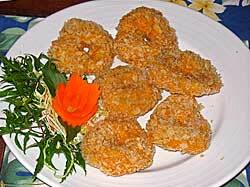 This blog looks at and celebrates the Thai frying expertise. Thais are very inventive with their frying and it seems that they will fry just about anything: seafood of all kinds (shrimp, fish, squid), meats (pork in many forms, duck, chicken), kanom (bananas, bread, dumplings), appetizers (shrimp and fish cakes) and even leafy vegetables (such as holy basil – bai kaprao). 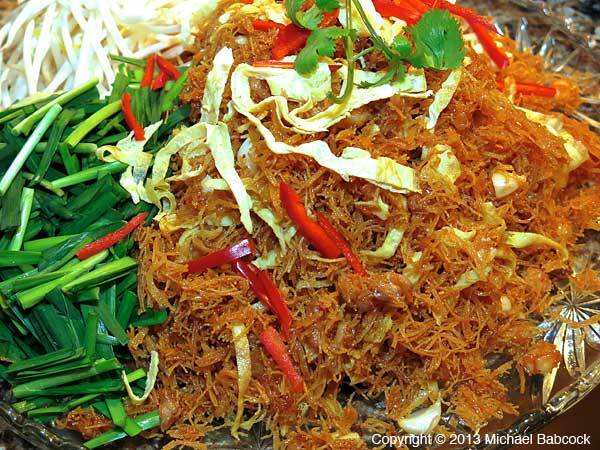 We’ve even come across Fried Green Papaya Salad (Som Tam Tod) while traveling in the northeast. 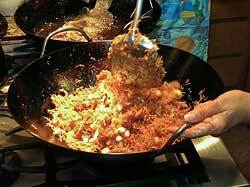 Thais fry foods so well: the foods seldom taste oily or greasy at all. On one of Kasma’s small-group trips to Thailand, one of the tour members went into a MacDonalds in Chiang Mai: his main take-away was how much better the fried foods were there compared to those in the U.S. 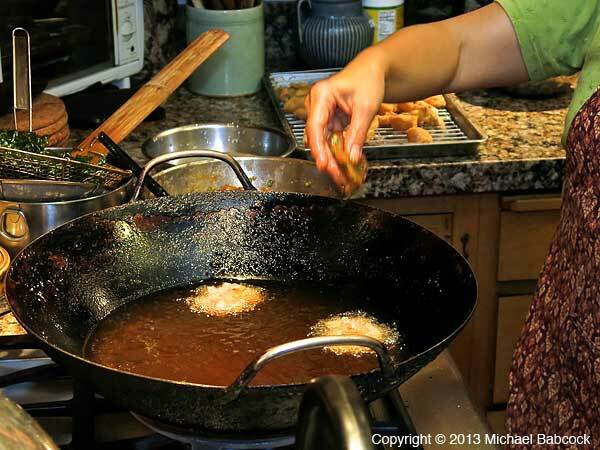 When a famous Thai chef says that “. . .Thais appear to remain ambivalent about it [deep-frying]. . .” I wonder if we’re talking about the same cuisine and people. The Thai word for fry is ทอด – tod (pronounced “tawd”), as distinct from ผัด – pad – which means “stir-fry.” ทอด (tod) can refer to food that has been deep-fried or pan-fried. Everything shown in this article was deep-fried. One only has to walk through a Thai market or anywhere that street food is being made or to look at the menu at most restaurants to realize that Thais love fried foods: you see them everywhere. They even fry leafy green herbs and vegetables. I’ll let the pictures below speak for themselves in celebrating the variety of fried foods that Thais enjoy. I’ll start with fried fish – one of the most common fried foods. There are at least dozens of different fried fish recipes in Thai cuisine, including many whole fried fish. 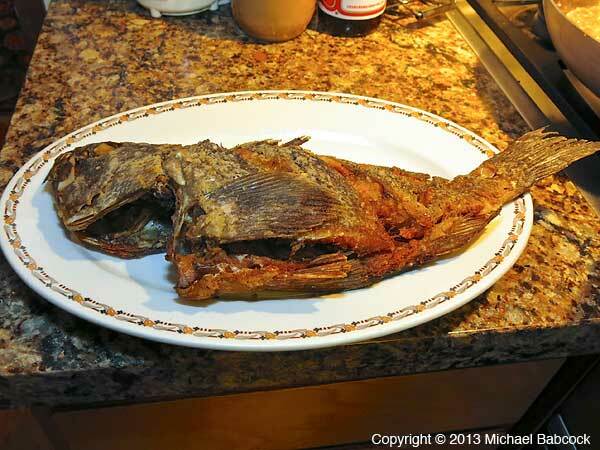 The first time I had a whole fried fish in Thailand, typically prepared so that it was quite crispy, I loved it: you could eat virtually the entire fish, including fins and most of the bones. 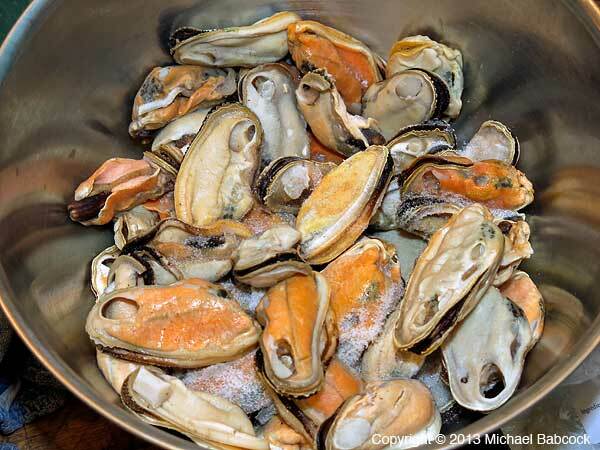 The crispy, crunchy feel in the mouth seemed to be an integral part of the whole experience. 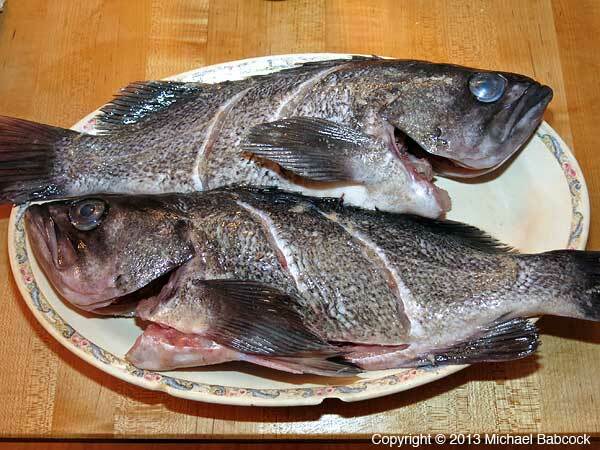 There was no oily feel at all – the fish might have been broiled crispy. 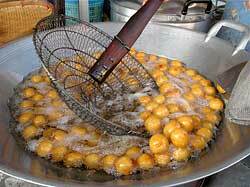 It was quite clear that Thais know their frying. I’ve heard many westerners (and 1 Thai) who thought that the typical crispy-fried fish was “over-cooked.” All of the Thais I know would disagree: they love the way the fish is cooked so that it’s crunchy and crispy and they devour nearly the whole plate (only the spine and a few other bones remain) with great gusto and enjoyment. 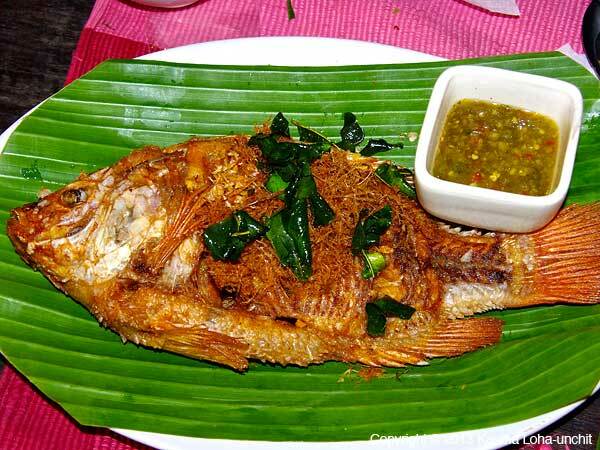 I’ve had too many deep fried dishes in Thailand that were not cooked as crispy as the typical fried whole fish to believe that cooking fish in this manner is anything but a culinary choice based on preference. 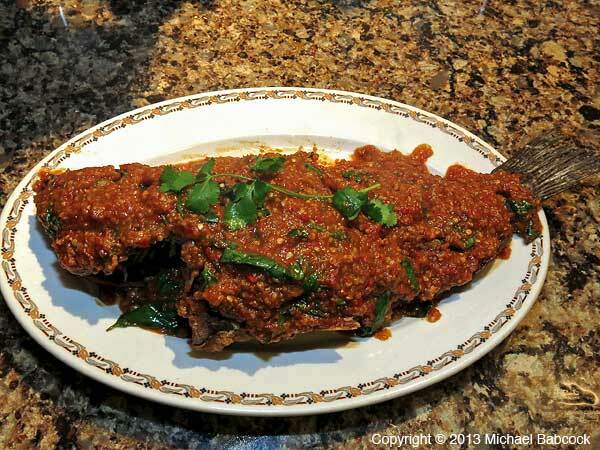 The fish shown above left also includes fried lemongrass and fried kaffir lime leaves. 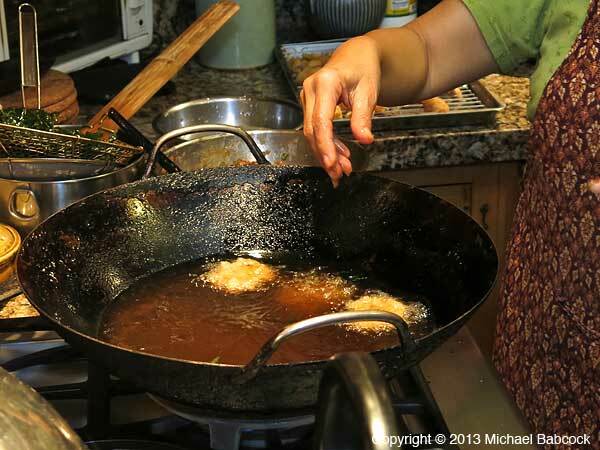 You may enjoy Kasma’s blog on How to Fry a Crispy Fish Thai Style. 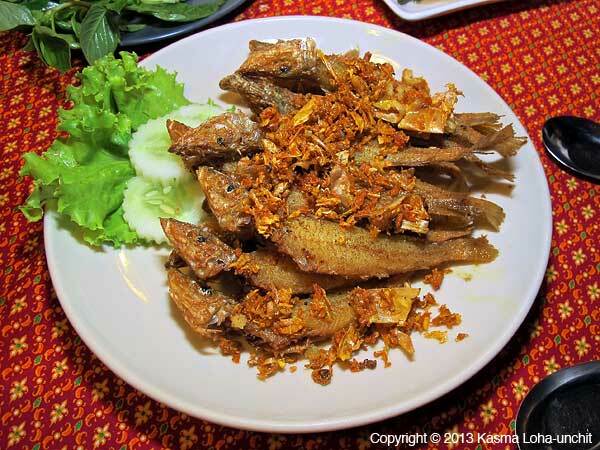 Scroll down on that page to see a Slideshow of Some Crispy Fried Fish Dishes with a dozen other whole fried fish dishes. 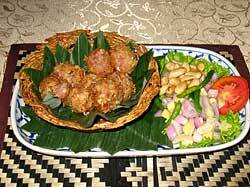 The picture above left shows a popular appetizer – Miang Pla – Tidbits with Fish Wrapped in a Leaf. 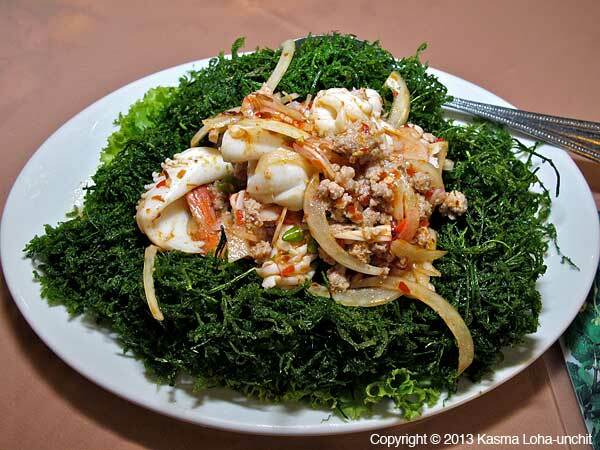 Kasma has an entire Thai cookbook (in Thai) of miang – dishes with tidbits – of which the best known is undoubtedly Miang Kam (Tasty Leaf-wrapped Tidbits). 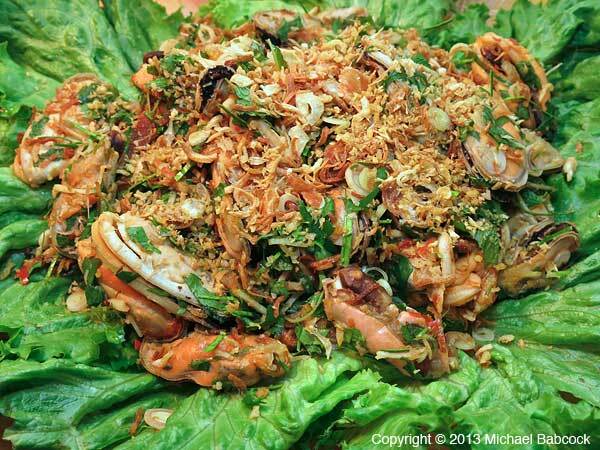 This dish is essentially Miang Kam with the addition of fried fish. In Thailand a wild pepper leaf (bai cha plu), not betal leaf, is the leaf of choice; you take a bit of the fish, a little bit of each of the other ingredients, add a dab of sauce and pop the whole thing into your mouth for an explosion of flavors. 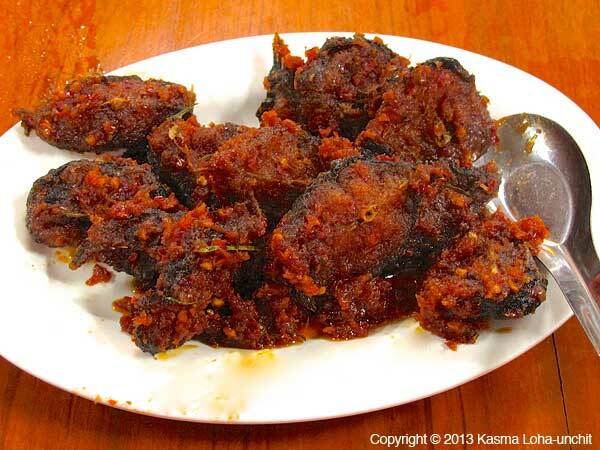 Above right we see Turmeric Fried Fish – Pla Tod Kamin – made from small fish that are fried (and eaten) whole. 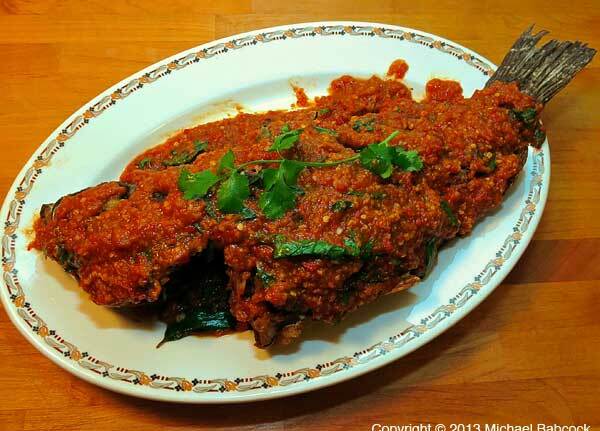 In addition to the fish, chopped garlic and turmeric are crispy fried to be served on top of the fish. 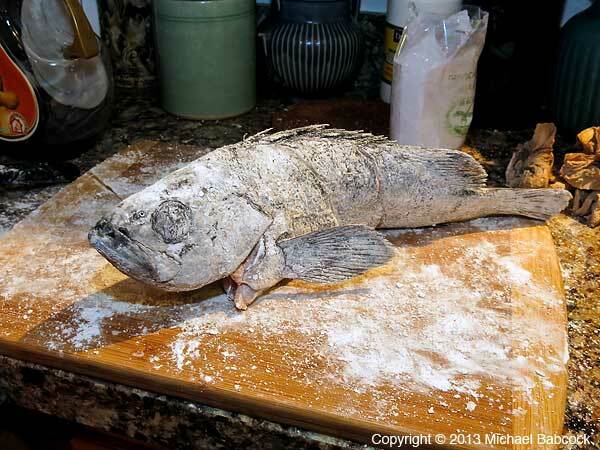 Although it sometimes seems as if the most popular way to fry fish is as an entire fish, it is also fried in chunks. To the right we see a dish popular in the northeast (in Isan, or Isaan) – Pla Som (Northeastern-style Soured fish). In this recipe, fish is cut into fillets or chunks, mixed together with salt and garlic and left out to ferment until it sours. 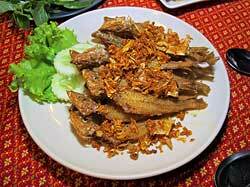 After this, the fish is crispy fried and served, often with fried garlic or shallots (more fried food! ), as shown above. 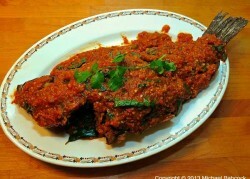 In the dish above right, the chunks of fish are fried and then cooked with a spicy choo chee curry sauce. Delicious. 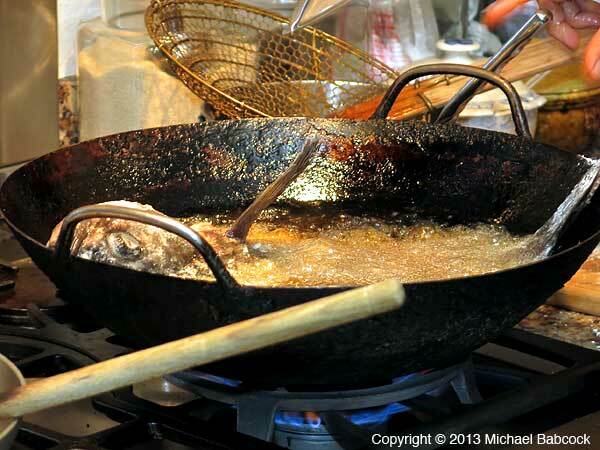 How much do Thais love fried fish? To the left is a simple dish you’ll come across at just about any Thai market or kao kaeng (rice-curry) shop, such as Raan Nong Pun in between Ayuthaya and Sukhothai on Asian Highway 1. 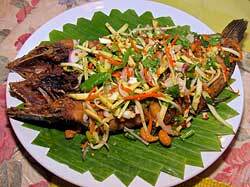 Fish is skinned, butterflied open, salted and partially dried in the sun; it is then fried crispy and eaten with rice. 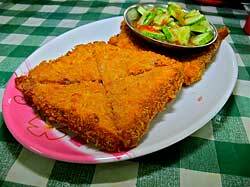 It is cooked crispy and simply like this because people love it this way. 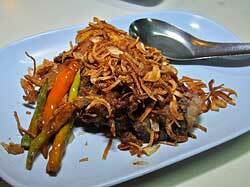 Many times when I’ve been eating with a table of Thais, this was the first dish to be devoured. 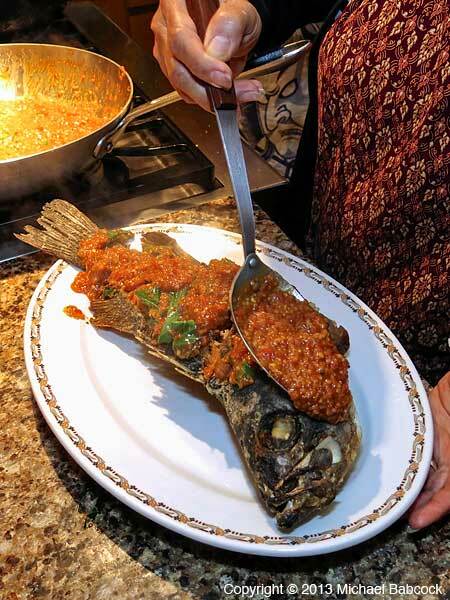 Fried fish is also used as an ingredient in soups and curries. 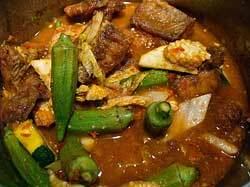 To the upper left we see Sour Tamarind Curry with Fish and Vegetable (Kaeng Som Pla). For this dish, taken from Kasma’s Intermediate Thai Cooking Class, #2, fish filets are cut into chunks, deep-fried and then added to the soup. 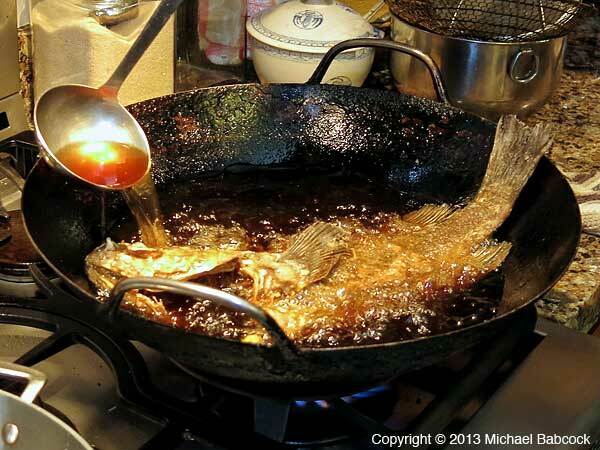 The dish could also be made with smaller, whole-fried fish: on our travels in Thailand we often have a Hot-and-Sour Fish Soup (Tom Yum Pla) made with whole, smaller-sized fried fish. 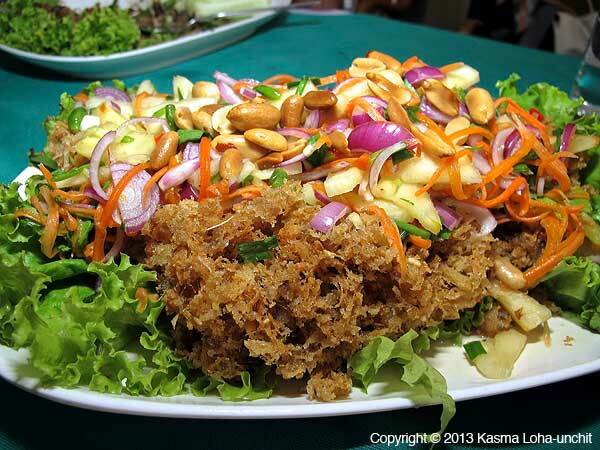 No survey of Thai fried foods is complete without including Crisped Catfish Salad with Sour Green Mango and Peanuts or Cashews (Yum Pla Doog Foo). 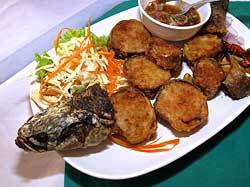 For this dish, a whole catfish is grilled until cooked through; it is then torn into shreds and the shreds are deep-fried until crispy and used in a salad, such as the one above right. 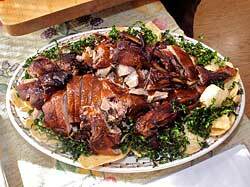 There is a similar salad that shreds roasted duck and fries it as the basis for a salad. This is not a dish for anyone ambivalent about fried foods. 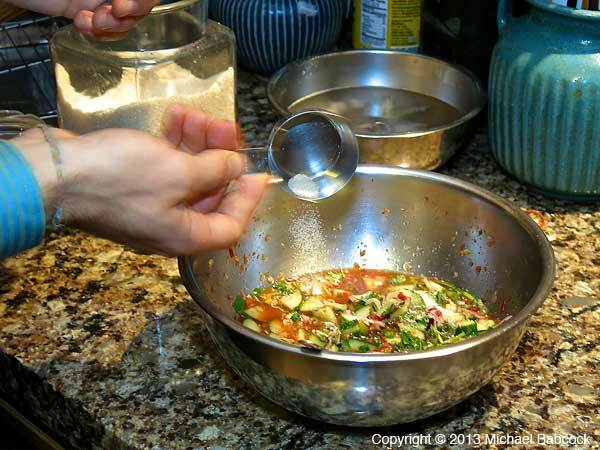 The peanuts (or cashews) in the dish are fried as well. 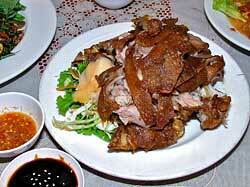 To the left above you see one of my very favorite fried foods – Fried Pork Leg (Ka Moo Tod). In this recipe, skin-on pork leg is first stewed with flavorful spices until it is tender; it is then deep-fried to get a caramelized, tasty outside to complement the succulent, tasty inside. 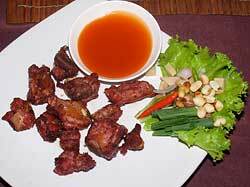 It is served with a dipping sauce or two (to the lower left in the above photo) and often with pickled ginger. We now find it all over Thailand, from Korat (as above), to Trang, to Bangkok to Ayuthaya. Sometimes the pork leg is smoked (prior to frying) adding another flavor dimension. 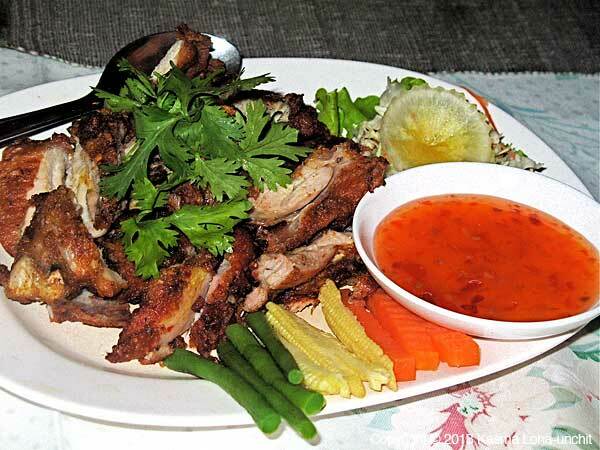 The Northern Fried Soured Pork Ribs (Naem See Krohng) from Chiang Mai pictured above is another widely available fried pork dish. 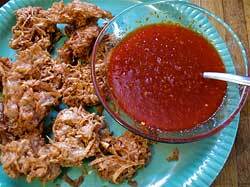 First pork ribs are fermented until sour and then they are deep fried. They are then served with a number of different items: peanuts (often fried, as well), ginger, Thai chillies and shallots. You pop the rib plus the other items of your choice into the mouth and eat them together. 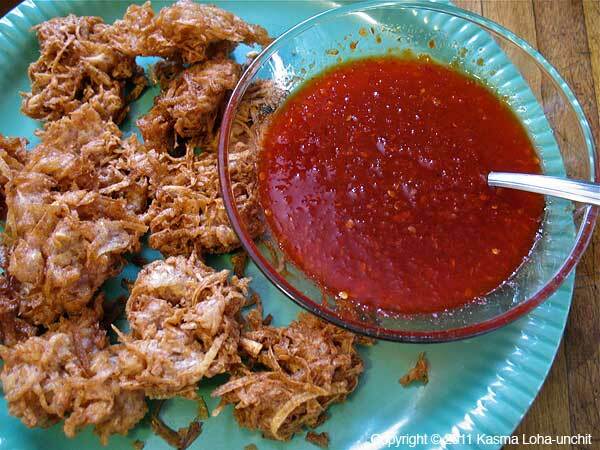 One item that is found in most of the markets is fried pork skin, such as that shown above left, where it is served with a Northern-pork-based dipping sauce – Nam Prik Ong. 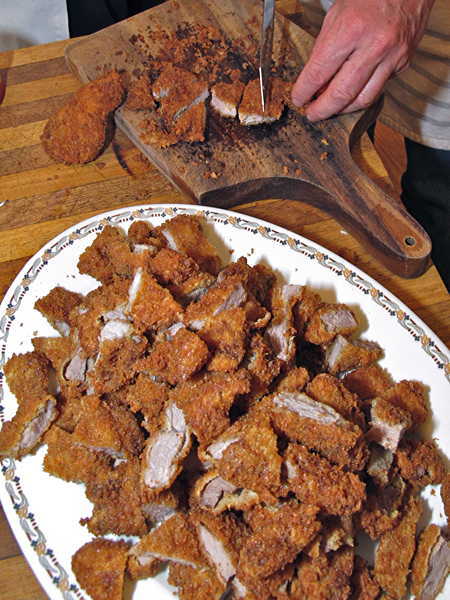 Another fried pork dish is Crisp-Fried Seasoned Pork (Moo Tod Kreuang Tod), where pork steaks or cutlets are marinated, “breaded”, then fried, then cut into bite-sized pieces and eaten with a dipping sauce. 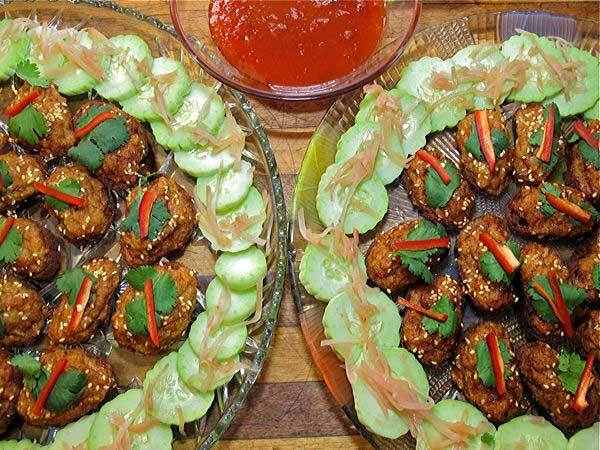 There’s also an Isan dish – Crisp-Fried Northeastern-Style Hot-and-Sour Chopped Pork Patties with Aromatic Herbs and Toasted Rice (Lahb Moo Tod) – with fried pork patties. 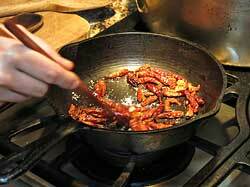 There’s also fried sour sausage – naem tod – which is shown further on in the blog. On the right above is Crispy Duck on a Bed of Shrimp Chips and Crisped Greens Served with Spicy Plum and Toasted Sesame Sauce (Ped Lon). This is actually a tri-fecta of deep fried items, with fried shrimp chips and crispy-fried greens in addition to the duck. This picture is taken from one of Kasma’s advanced Thai cooking classes. 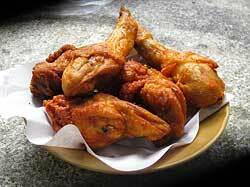 Lately I seem to run across Fried Chicken in all of the markets, northern, central or southern. 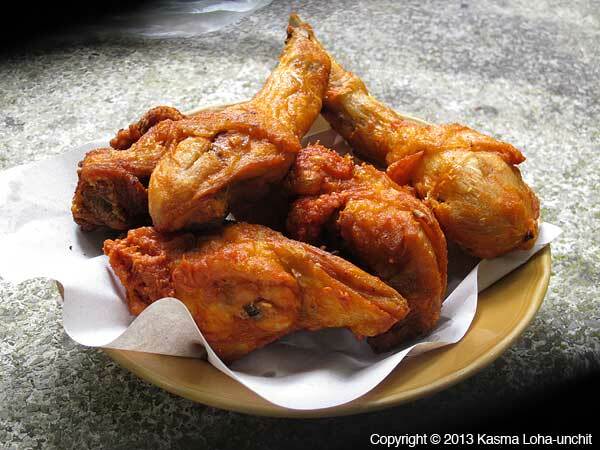 The delicious looking golden-fried chicken above is from outside of the Crystal Pool in Krabi. Most of the street-food chicken is similar in appearance: golden and crispy. Fried chicken in Thailand is some of the best I’ve ever had: one reason is that most of the chicken is deep-fried in palm oil. 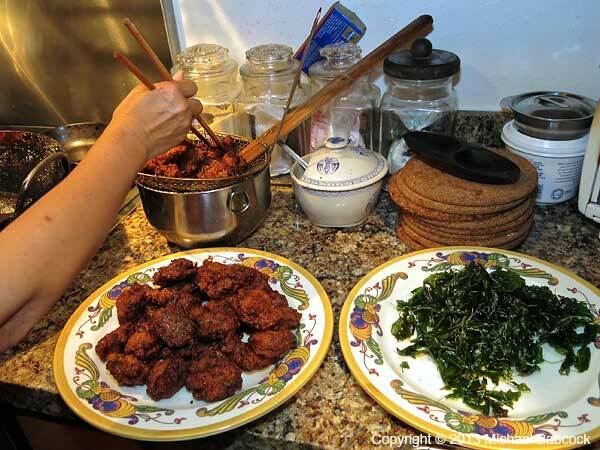 Also, the taste of the chickens in Thailand is better: when Kasma was developing this recipe for an advanced class, she found that the type of chicken made all the difference – the big-breasted chickens found in American supermarkets just do not fry up as tasty. 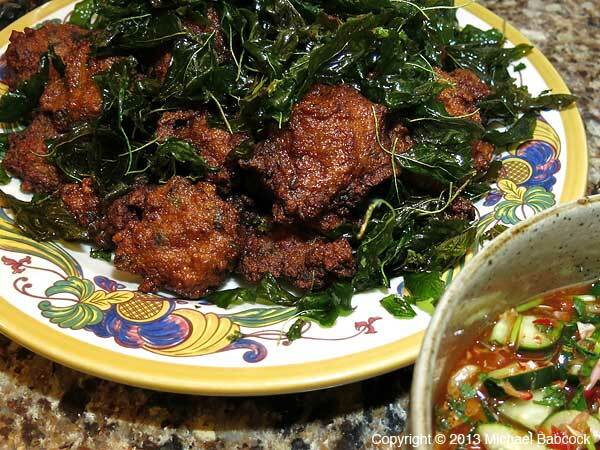 In restaurants, you’ll often find fried chicken such as that in the above right picture: Crispy-Fried Turmeric Chicken (Gai Tod Kamin) from Bai Fern Restaurant in Mae Hong Son. 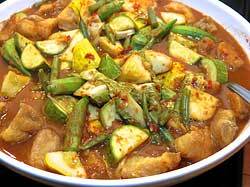 After the chicken is fried, the various pieces are chopped into bite-sized pieces and served with a sweet-and-sour chilli sauce, such as that on the plate, and often some accompanying vegetables. You can see that the chicken is crispy on the outside and moist on the inside (click the picture for a larger image). Thai frying enjoyment and expertise is not limited to the animal kingdom: they also are adept at creating delicious fried vegetables. To the upper left is a salad at Vientiane Kitchen in Bangkok that uses long eggplants fried in batter as the main ingredient: it is quite delicious. To the right, crispy fried greens (Kasma uses pak boong – morning glory – in her recipe) are pretty much the whole salad with the addition of a tart, sweet and hot pork sauce poured over it (Kasma’s version of this recipe uses shrimp): it is crunchy, spicy and delicious. The fried vegetable does not taste greasy or oily. The picture on the left shows Fried Sour Sausage (Naem Tod). I’ve included it here under vegetables because the fried sausage is resting in an edible basket made from crispy-fried taro. It’s a fun dish: you get to eat the basket as well as the sausage. 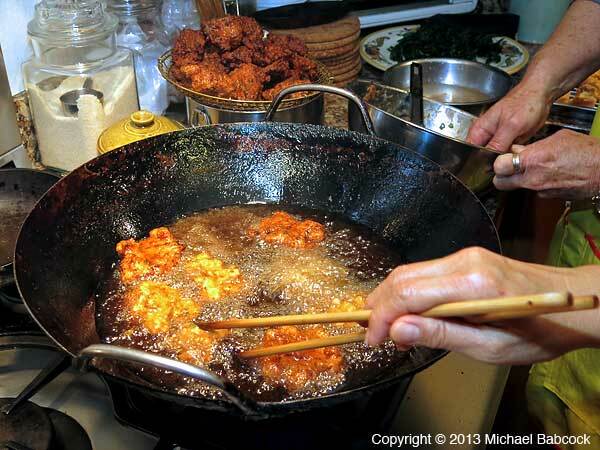 Next to to it on the right we see Crunchy Taro Fritters, Served with Sweet-and-Sour Dipping Sauce (Peuak Tod). 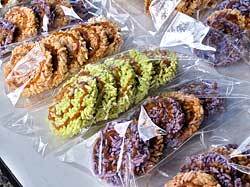 In addition to making taro fritters, you often see fried taro chips in the markets; they come in two varieties, sweetened and un-sweetened. 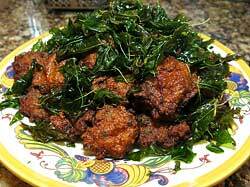 Is there another cuisine where fried leafy greens or herbs can form such an essential part of a dish? 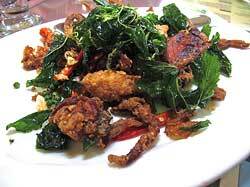 The Crispy Fried Cha-Om Salad (Yum Cha-Om Krob) above left is from A. Mallika Restaurant in Bangkok. 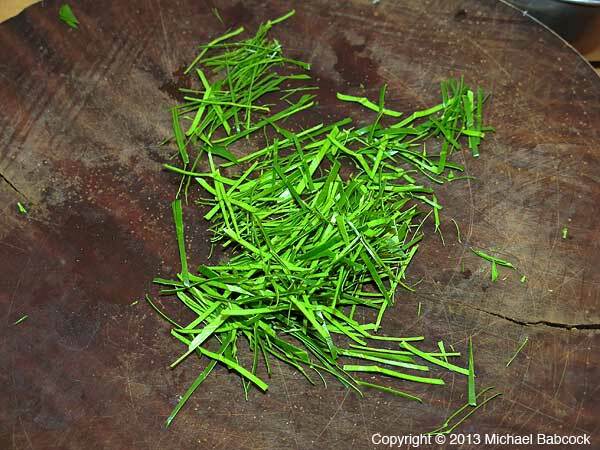 Cha-Om is part of the acacia family – see Kasma’s blog: Cha-Om – A Delicious and Nutritious Tropical Acacia. 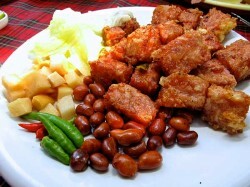 The fried vegetable is topped with a yum-type salad, in this case pork and squid with a sour-salty-sweet-spicy hot sauce. Holy basil (bai kaprao) is the leafy green I’ve seen crispy-fried most often. Above right it accompanies a Fried Soft-shell Crab dish at our favorite Pranburi restaurant – Sunni’s Restaurant; the soft-shell crabs are deep-fried as well. The same restaurant makes a Stir-Fried Basil Crab (Neua Poo Pad Kaprao) that also uses deep-fried holy basil. 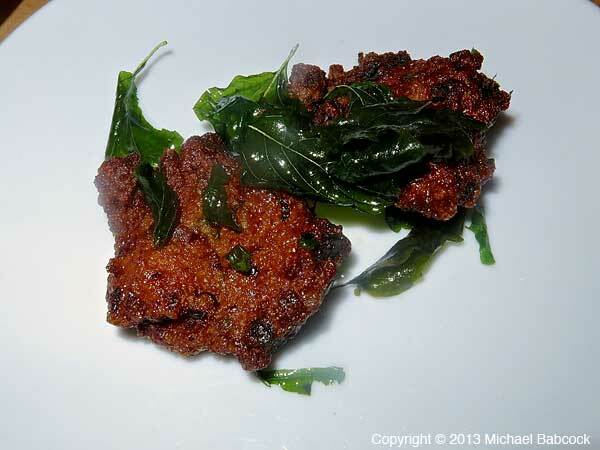 Crispy-fried basil is also often served with Fish Cakes (Tod Man) and we’ve also seen it in the Crispy Fried Duck above. 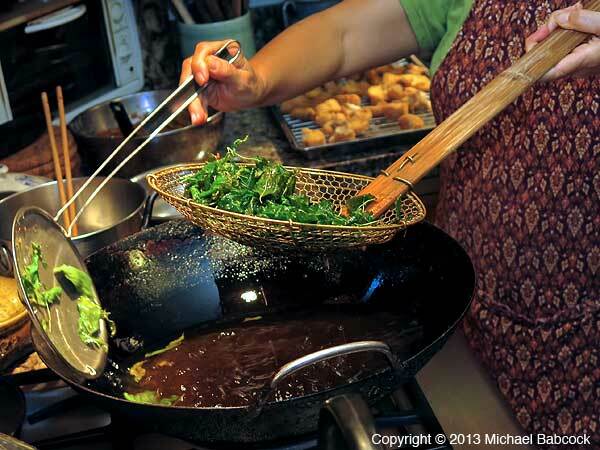 I’ve also seen fried kaffir lime leaves on a number of dishes. 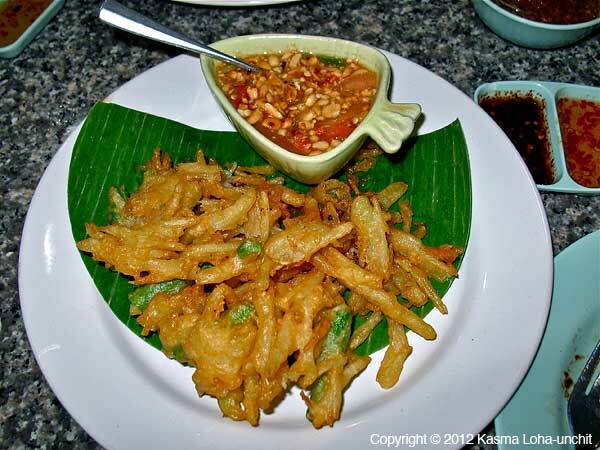 It’s not enough to have dishes where fried foods are the main attraction: there are also various other fried items that provide an accent or an accompaniment to various Thai dishes. 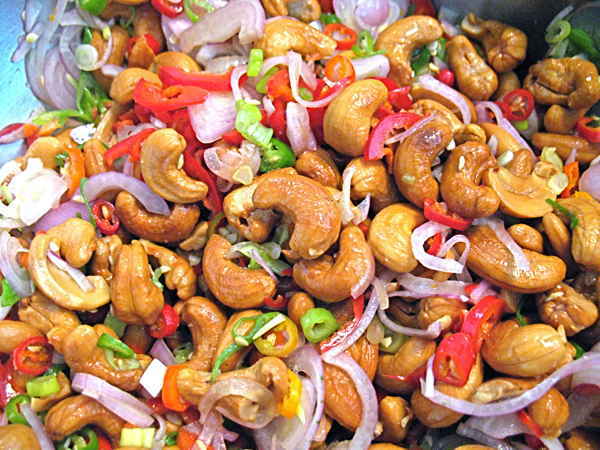 Fried cashews are found in many salads, such as the Yum Mara (Bitter Melon Salad) above left. 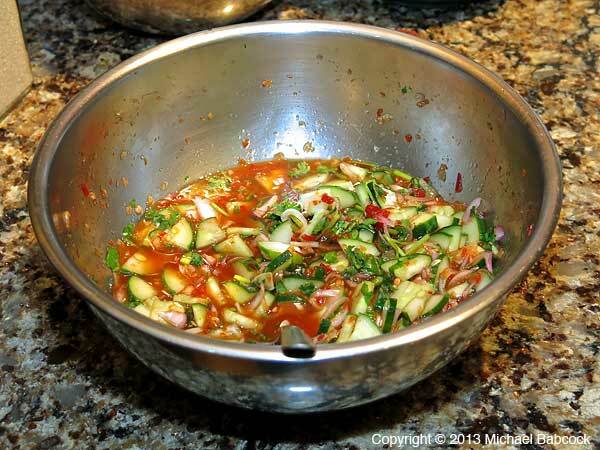 They also form the main ingredient of a spicy, limy Cashew Salad (Yum Med Mamuang). Both salads above feature fried shallots, as do many yum-type salads. 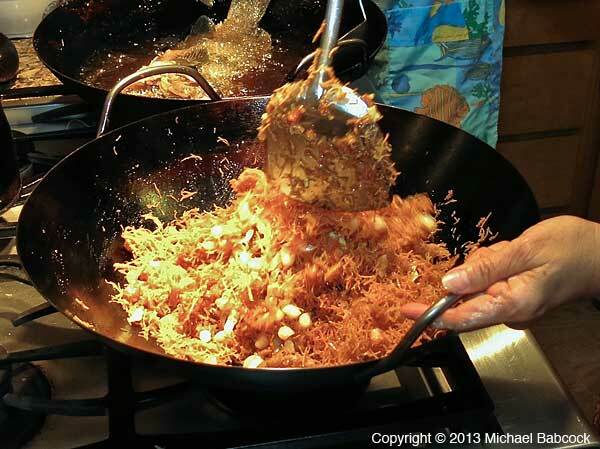 It’s hard to describe how delicious this ingredient is: the frying seems to accentuate the sweetness of the shallots. Yummy. The Eggplant Salad above also uses crispy fried shallots. Fried peanuts are an ingredient that frequently accompanies certain dishes, such as fried naem sausage or ribs, where it is eaten with the sausage (along with ginger and Thai chillies). Above left we see them with the Crispy Rice & Sour Sausage Salad (Yum Naem Kao Tod) from Ton Kreuang Restaurant in Bangkok; the base of the salad is cooked rice, which is mixed with various ingredients, including a chilli paste, formed into rounded balls and deep fried until the outside is brown and crispy. Both of the above pictures feature fried dried red chillies. You are meant to bite off a bit of the fried chilli to go with some of the salad or fish: it provides added heat, flavor and texture. 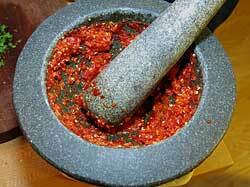 Dried chillies, in the form of dried red pepper flakes, are also fried in oil along with a bit of salt to make a chilli-oil that is served with Kao Soi – Northern Style Curry Noodles. 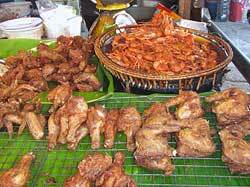 Fried foods are found at pretty much every open-air market or street-food scene in Thailand. 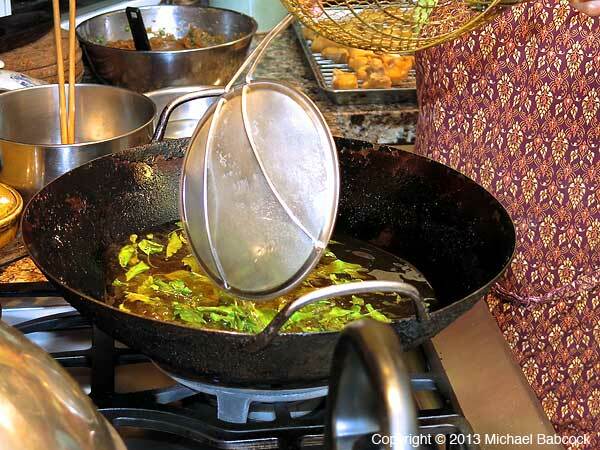 You’ll typically find many woks bubbling away with oil. 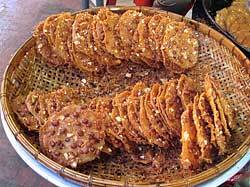 Fried Dough, such as that above left from the Sukhothai Market is fairly common, particularly in the morning at breakfast time. 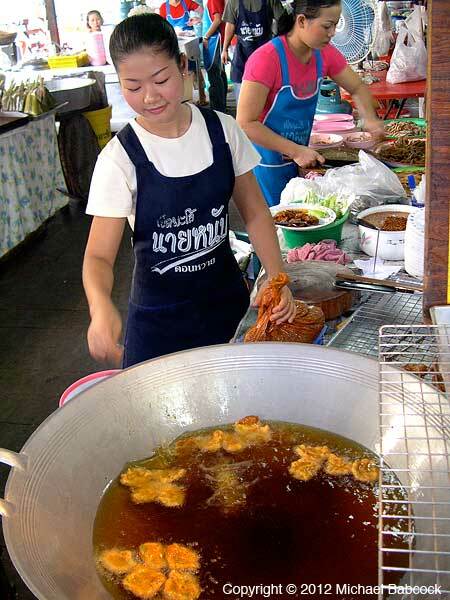 Another common market food consists of small, fried shrimp in batter, such as the picture above left from the Takua Pa Market. 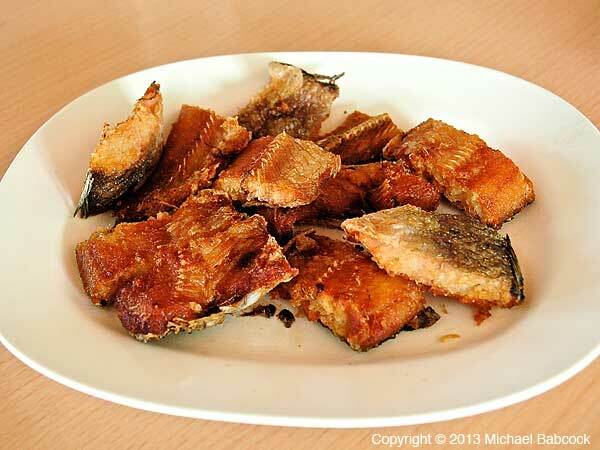 Fried Fish Skin, such as that shown above right, is one of the tastiest fried snacks. 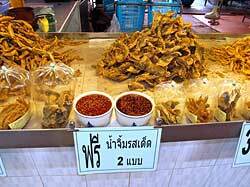 Click on the picture from the market at Wat Yai Chaimongkhon in Ayuthaya – in the larger version you’ll see that there are several different kinds of fried fish skin, varying in size and texture. 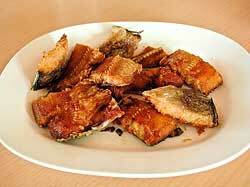 The fried fish skin is sold with one or two different dipping sauces as accompaniments. Kasma always buys a few varieties for her tour-group members to taste: often skeptical at first (“You want us to eat fish skin? !”), they usually eat up everything she buys. 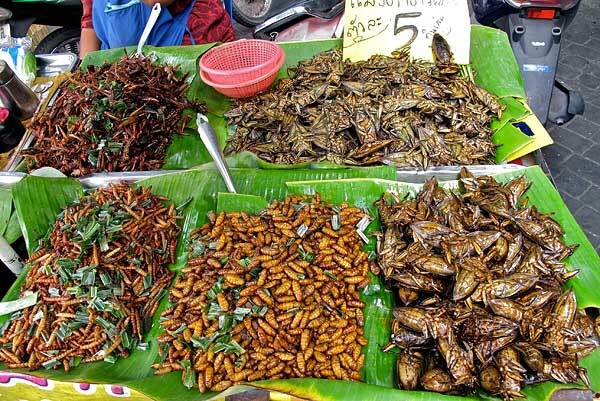 I was somewhat surprised the first time I tried fried insects: they are actually pretty tasty. In much of the world, insects are a legitimate food; after all, they contain fair amounts of protein and fat. 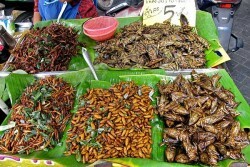 The variety of insects shown to the left are from the market at Nakhon Pathom and as you can see (click on the image for a larger version) there are many different varieties: all fried. I’m including the Fried Naem Sausage (seen above right) here, though this picture is from the restaurant Kaeng Ron Baan Suan in Chiang Mai, because it is often found as a street food. You select any of the other items on the plate (chilli, ginger, fried peanuts, cabbage) and pop them in your mouth with a piece of sausage. When you buy it on the street, you get a log bamboo stick, which you use to spear a sausage bite, with the accoutrements in an accompanying plastic bag. 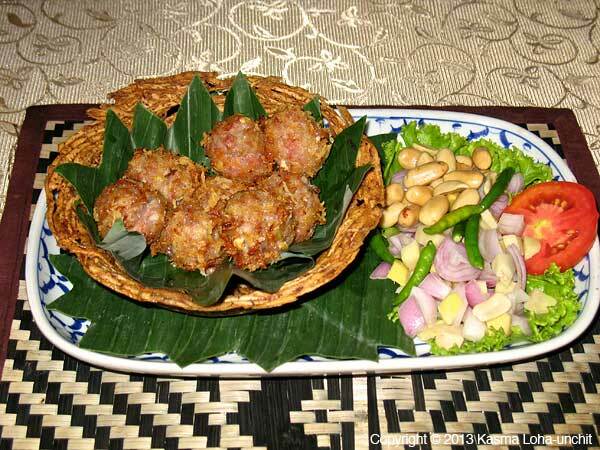 In the fried fish section above, the dish Miang Pla is often served as an appetizer; also the Fried Naem Sour Sausage directly above. 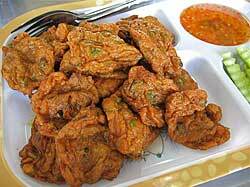 If I was told that Fried Fish cakes (Tod Man Pla) are the most popular appetizer in Thailand, I would not be surprised. You see them everywhere: in nearly every market (I could have included this is the Street Food section above) and in many restaurants. 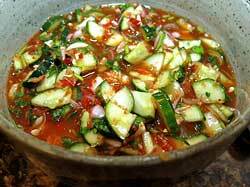 These are nearly always served with the sweet dipping sauce shown in the picture above left and a cucumber relish/salad, which is not pictured. 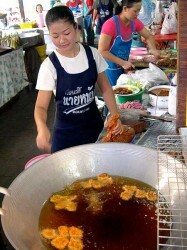 This photo was taken at Don Wai Market in Nakhon Pathom province; The very first picture in this blog shows a young woman frying these fish cakes at the same market. The second photo (to the right) shows another type of Tod Man, which is fried after being “breaded.” It is Tod Man Goong – Fried Shrimp Cakes – from the restaurant at Koh Poda in Krabi province. These are served with just a sweet dipping sauce. Tod Man is characterized by a rather “bouncy” texture. The above left picture shows Glazed Crispy Noodles – Mee Krob – from Kasma’s First Intermediate Thai Cooking Class. Thin rice sticks (a type of noodle – sen mee in Thai) are fried until golden and crispy at the edges and then crumbled in a bowl and coated with a sweet sauce (also slightly sour and salty). It is typically served with egg shreds, slivered red chillies, bean sprouts, garlic chives or green onions, to help cut any oiliness left on the noodles. In restaurants this dish is often too sweet for my taste. 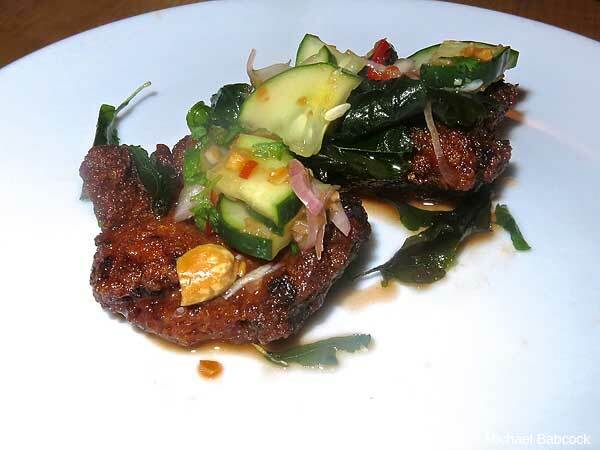 The second picture shows Crispy Shrimp Toast, Served with Cucumber Relish – Kanom Pang Na Goong – from Trang. 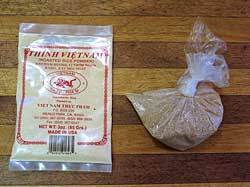 In this recipe, a shrimp mixture made from ground shrimp, more like a paste really, is spread over bread and then deep-fried until brown. Kasma’s version uses both shrimp and crab and is served with a sweet-and-sour plum sauce; in the version above right, it is served with a slightly sweet cucumber relish. There’s also Crispy Pork Toast and Crispy Crab Toast. 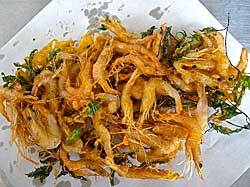 Another appetizer, above left, from Ubon Ratchathani, is Crispy Fried Won Ton. I include it here even though won ton are really more Chinese than Thai. I’ve included the second picture because I love the presentation. it shows Deep-fried Fish Sausage presented in-between the (fried) fish head and tail; it comes with the sour/spicy dipping sauce shown on the plate to the upper right. We had this at the restaurant Kai Mook in Mae Hong Son. Fried Bananas – Kluay Tod – are one of the most common street foods. It is also a fairly common dessert in restaurants. The picture above left actually is from the Mae Sa Resort above Chiang Mai: it’s a bit puffier than most of its street-food variety counterparts. You’ll also find fried banana chips in nearly any market or kanom shop. The second picture is from a market at Wat Yai Chaimongkhon in Ayuthaya. It shows Fried Peanut Crunch (Tua Tod Paen), a tasty fried kanom that you’ll see in some of the markets around the country. They are slightly sweet (not overly so), crunchy and tasty. 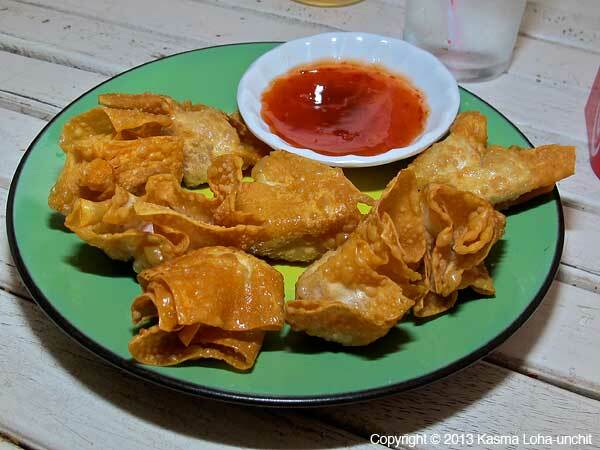 As you watch this, reflect on the fact that you are seeing a fraction of the fried dishes available in Thailand. Written by Michael Babcock, January 2014. The views of this blog are those of the author only. Any errors are his alone. 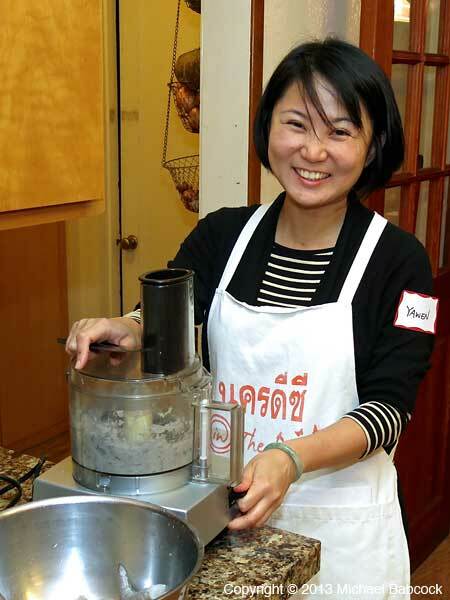 Kasma Loha-unchit’s 4-session Intermediate Thai Cooking Series takes up where her Beginning Thai Cooking Series leaves off. 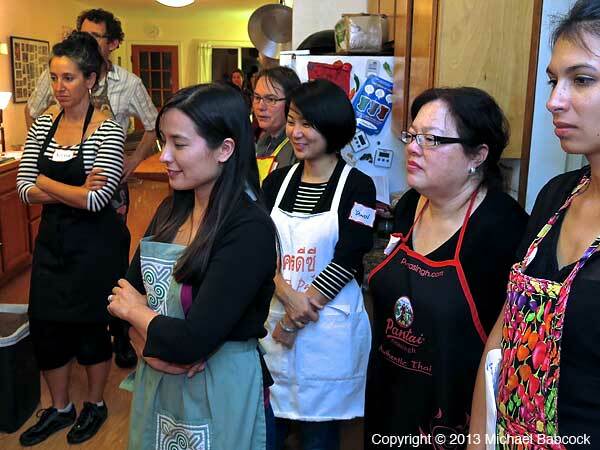 It’s a chance to learn new ingredients, techniques and Thai recipes. 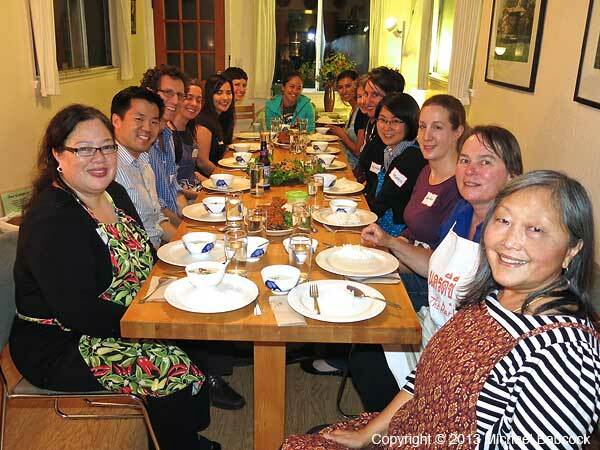 This blog is about the second Intermediate Cooking Class. 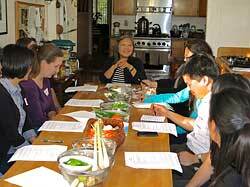 As always, the class begins with a snack and with an explanation of the recipes. Although most of the main ingredients were previously introduced in the 4-session Beginning Series, there are more to come in the intermediate classes. 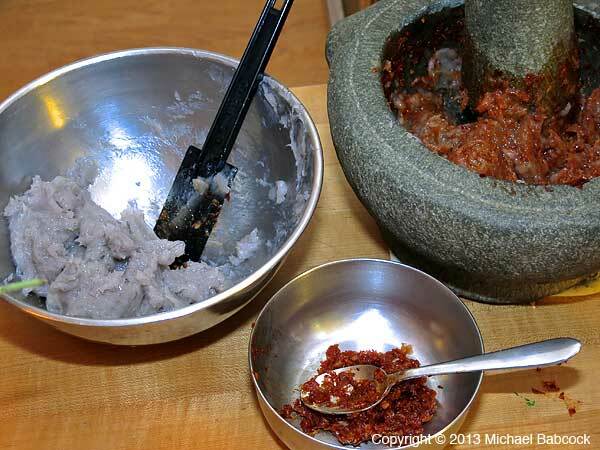 In this second class, students learn about roasted rice powder, kaffir lime peels (they’ve already been introduced to the leaves), and shrimp paste (kapi or gkabpi). In this class, dried chili peppers are an important ingredient in three of the recipes. Kasma explains the two types that will be used this evening and explains how to prepare them: by seeding and soaking in one instance, and by roasting stove-top in another. 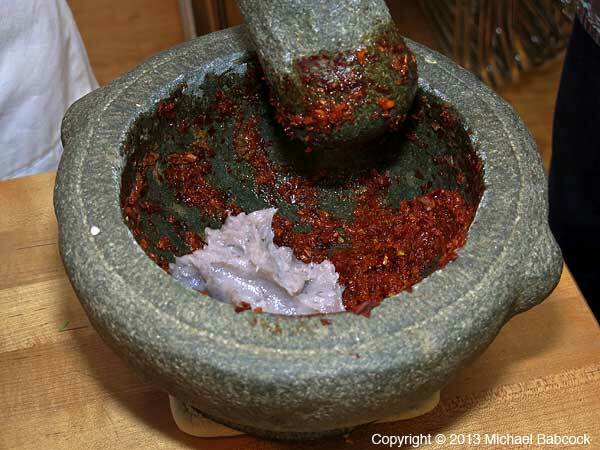 Students use the mortar and pestle extensively in this series. 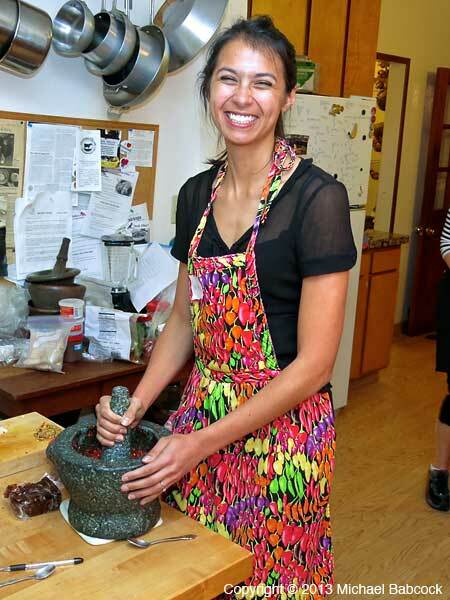 Three of the recipes in this class, involve intensive pounding so Kasma goes into the basics of how to go about it. 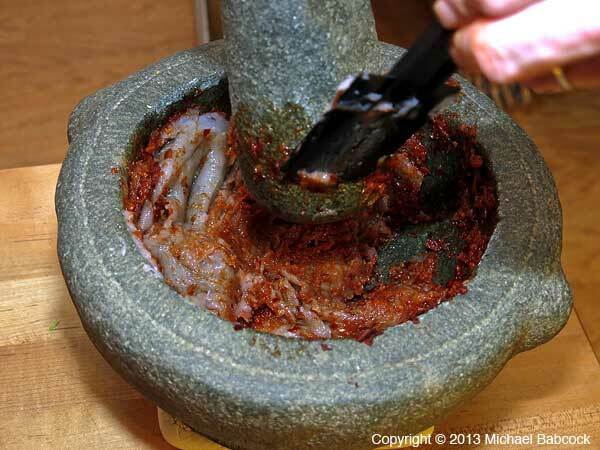 The mortar and pestle are essential tools in Thai cooking: they crush the fibers of herbs and release the essential oils, giving a greater breadth and depth of flavor than can be obtained by using a food processor. You can read Kasma’s blog on The Mortar and Pestle. After the recipes are explained, students volunteer (or are assigned) to one of the recipes and break into teams to do the preparation. Kasma supervises making sure everything is done correctly. 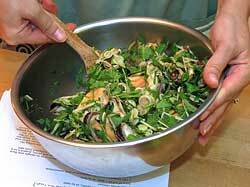 In this class, dried galanga is used in the Northeastern Chicken salad, after being roasted stovetop in a cast iron pan. Of course, there’s the feast at the end of the class. And after the feast, everyone helps to clean up. One thing I appreciate about Kasma’s classes is that you learn how to prepare the food in a manner similar to how you cook in your own kitchen. 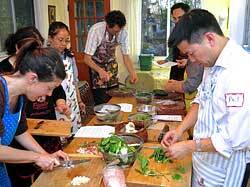 Many cooking classes in Thailand assign a cooking station to each student and have them cook their own individual portion from already prepared ingredients. In Kasma’s class, students do every aspect of the meal preparation, from chopping, roasting and pounding to cooking, eating and clean-up, just as you will at home. Everyone gets to watch the final assembly of every dish, learning how to prepare every dish in the class, rather than just the single dish they’ve worked on. I recently read in a cookbook by a famous Thai chef that said “Thais appear to remain ambivalent about [deep-fried foods].” They certainly have a strange way of showing this: you find fried foods everywhere in many forms – fried fish, chicken, duck, pork leg, bananas, other desserts and, of course, Tod Mon – fried fish (or shrimp) cakes. 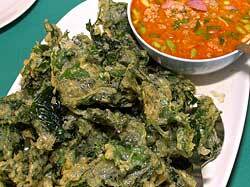 Thais even deep-fry herbs such as Thai basil (as in this dish). 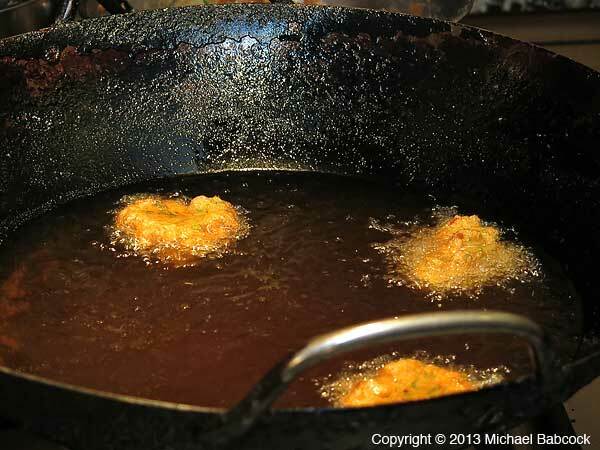 Certainly Fried Fish Cakes (Tod Mon) are among the most common and beloved of Thai snacks and appetizers: you see them frying in open-air markets and sidewalks everywhere in the country; they are also found in many restaurants as an appetizer. 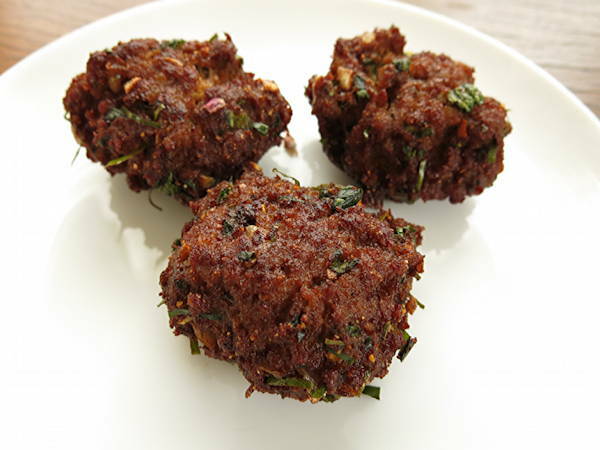 This class showcases Kasma’s version of Tod Mon; her recipe is really a Tod Mon Pla (Fish Cake) recipe that is made, instead, with shrimp (goong). 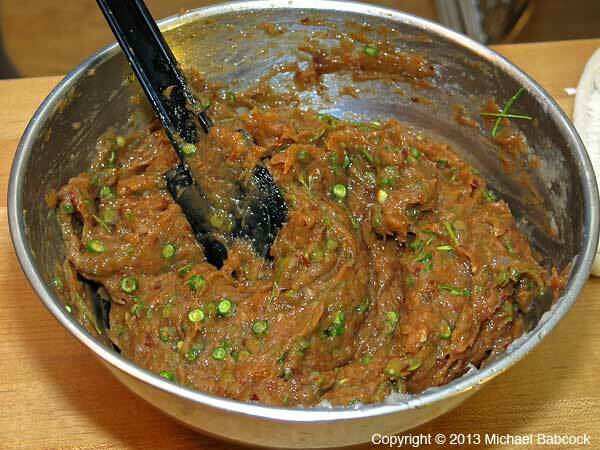 This is a relish that accompanies the Fried Shrimp Cakes and is sweet, sour and salty. 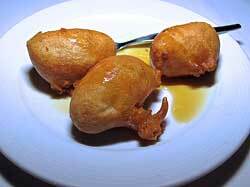 It has a refreshing taste that forms a nice contrast to the fried cakes. Be sure to see our slideshow on Tod Mon Goong below. You may be confused as to why this dish, without coconut milk, is called a “curry.” Actually, there are probably more Thai “curries” without coconut milk than with; for the Thais, the classification of what we translate as curry – kaeng – is really a broader classification. 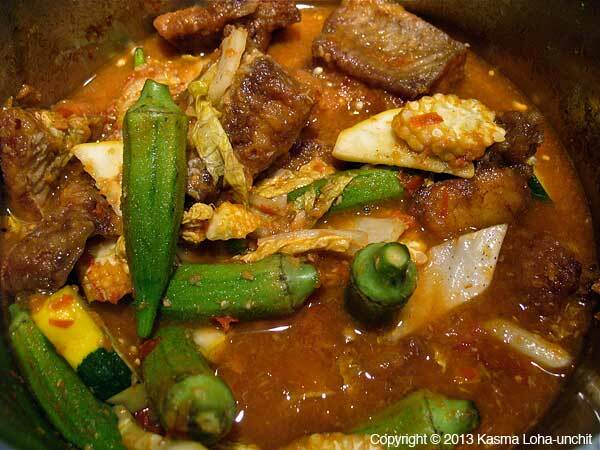 Read Kasma’s blog Thai Curries – Kaeng (or Gkaeng or Gaeng). 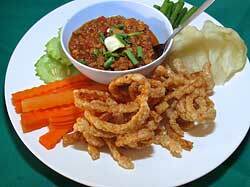 This is one of the classic Thai dishes, here in the central Thai version. 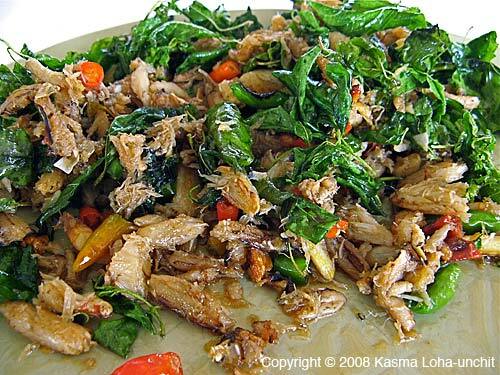 Kasma’s version is thick from vegetables and broiled, flaked fish in the broth. 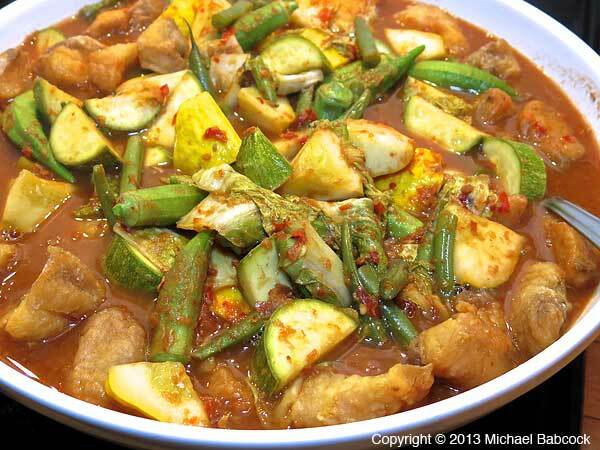 Kaeng Som is made in a different version in Southern Thailand and is often called Kaeng Leuang there: you have to get through to Kasma’s Advanced Set G to learn how to make her Southern version, delicious and spicy hot. 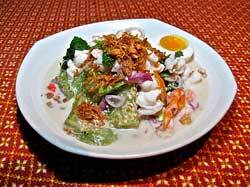 You may enjoy the Bangkok Post article ‘Kaeng Som’ A Thai culinary classic by Suthon Sukphisit. 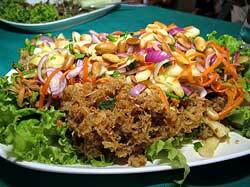 Larb (often transliterated as laab and pronounced “lahb”) is one of the two main types of Thai “salads” prevalent in the West. (The other would be yum.) 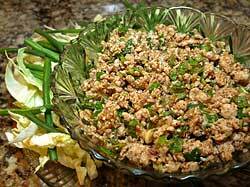 They typically involve chopped (or ground) meat flavored with fish sauce, limes, a bit of sugar (to balance flavors, mainly to bring out the sour of the limes), lots of ground, roasted chillies and roasted rice powder. 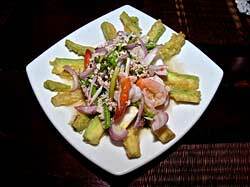 It’s served with a vegetable platter: you eat the salad with the vegetables to cut the heat. 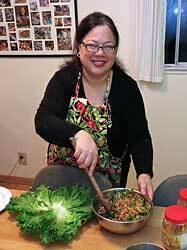 In Kasma’s classes you learn all about balancing flavors to create authentic Thai tastes. Ingredients such as fish sauce or limes (for instance) can vary brand to brand or batch to batch, so Kasma’s tasting exercises teach you how to work with different ingredients to get the correct Thai harmony of flavors. 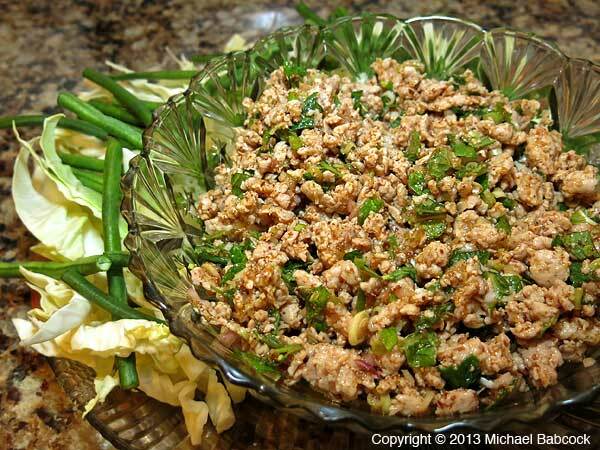 You can try out Kasma’s recipe for Northeastern-Style Spicy Minced Chicken Salad (Laab Gai). I find Asian vegetables so very much more interesting that American vegetables. 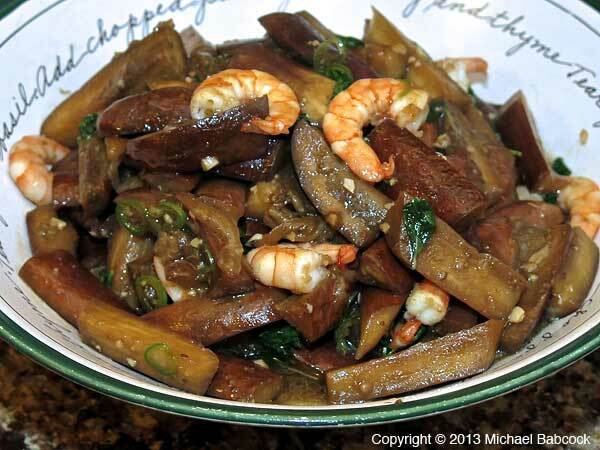 Thais do wonderful things with eggplants and I love this stir-fried dish. It’s a simple dish, flavored with oyster sauce and fish sauce with just a bit of vinegar added to the end to provide a bit of sour. 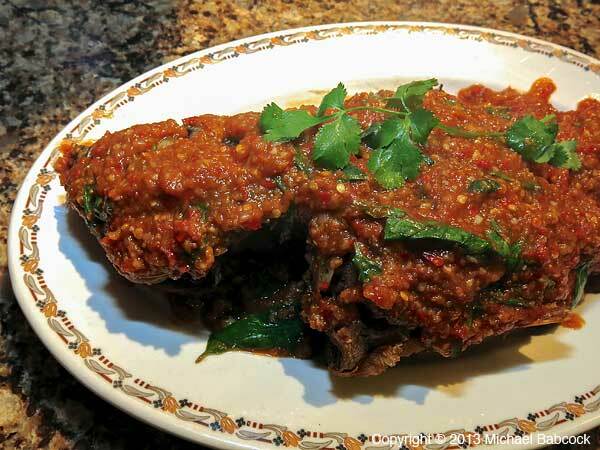 It’s a wonderful dish and relatively easy to prepare. 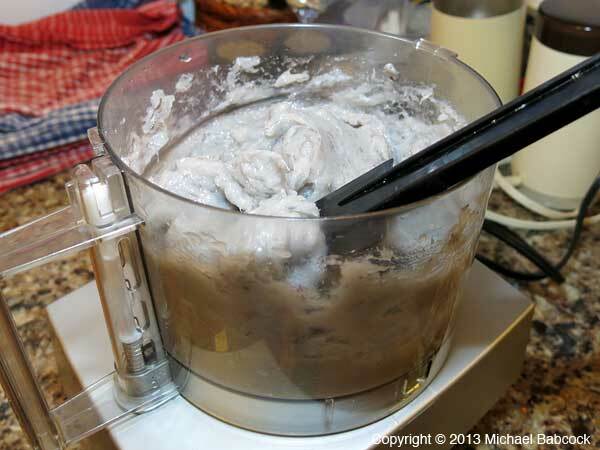 Shrimp reduced to a smooth, sticky, gray paste. You can find out all the necessary details about class times, dates and policies on our website. Class details – times, policies, etc. Kasma’s Picasa Albums – including 100s of photos, mostly of advanced classes. 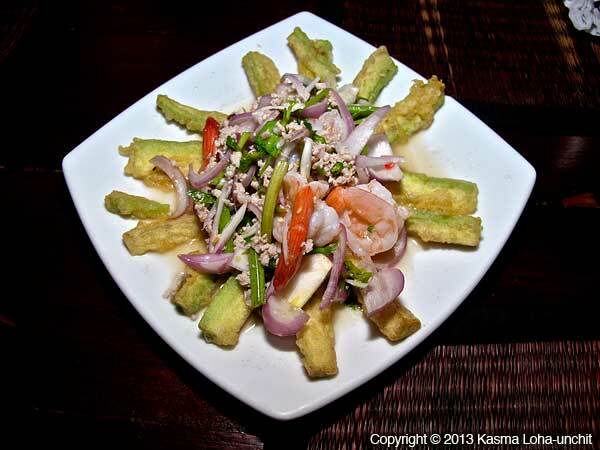 Kasma’s Yelp Reviews include many reviews from students; be sure to check out the pictures on Yelp. 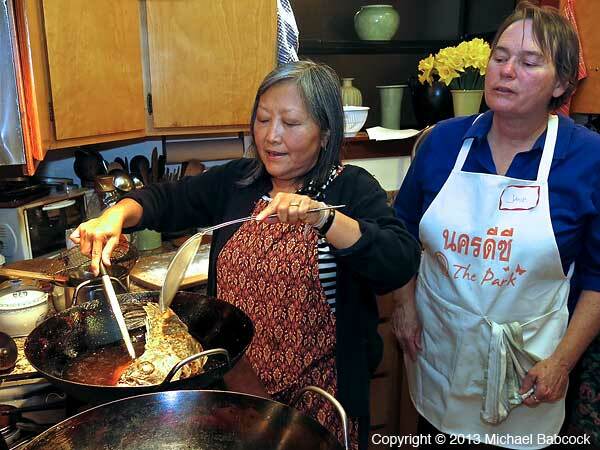 Kasma’s Intermediate Thai Cooking Class, a weekend series of 4 classes, continues on from where her 4-session Beginning Thai Cooking Series leaves off. 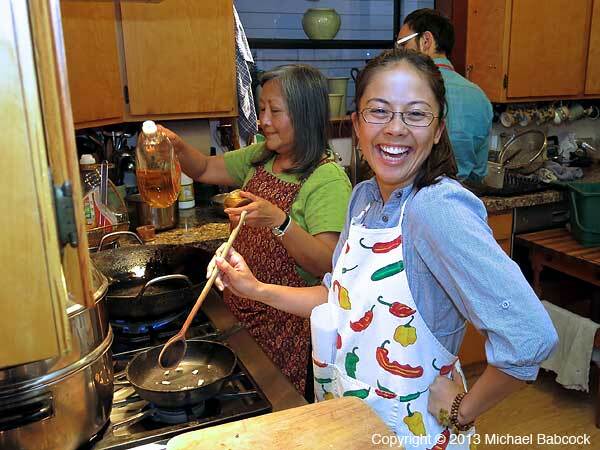 Once she’s introduced students to the basics (including how to harmonize flavors to create Thai tastes), it’s time to learn more Thai cooking techniques, ingredients and recipes. I repeated the Beginning Thai Cooking Series in October of 2011 when Kasma was still teaching in the evenings and was surprised at how much new information I gleaned from repeating the class. I also remembered just how much fun the classes are. 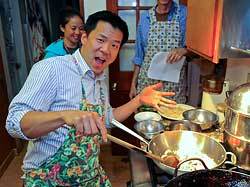 This April, I repeated Kasma’s Intermediate Thai Cooking Class. This is my blog on class #1. 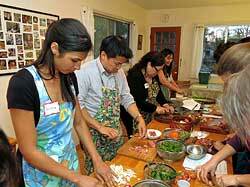 The classes are filled with tips that make recipes come out better. 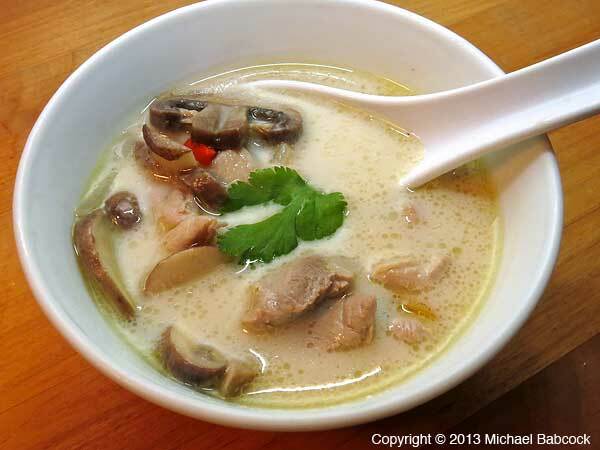 For instance, Many recipes for Chicken Coconut Soup (Tom Ka Gai) have you dump all the coconut milk in a pan and bring it to a boil; Kasma explains that when boiled, coconut milk has a tendency to curdle, so she begins the recipe using water or mild chicken broth and adds the coconut milk towards the end, right before she balances all the flavors. Kasma imparted more inside knowledge when talking about the preparing the noodles for frying for the Mee Krob (Glazed Crispy Noodles). Rather than soaking the noodles, which would leave them soggy, she has the students rinse the noodles in cold tap water, drain in a colander and set aside for 30 to 60 minutes. 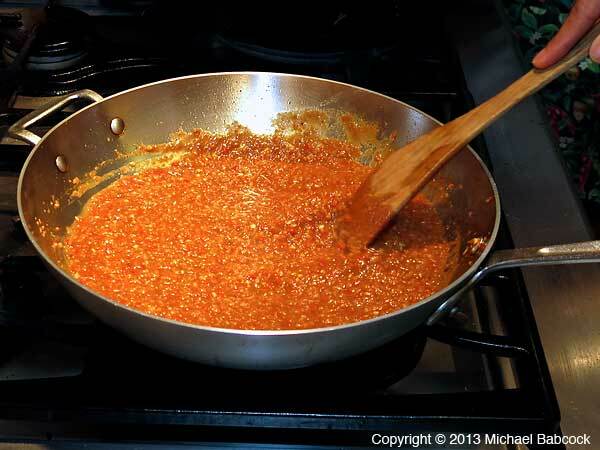 This allows the noodles to absorb some water and soften while then allowing the surface to dry out so that you won’t get splattering when you put the noodles in the hot oil to fry. 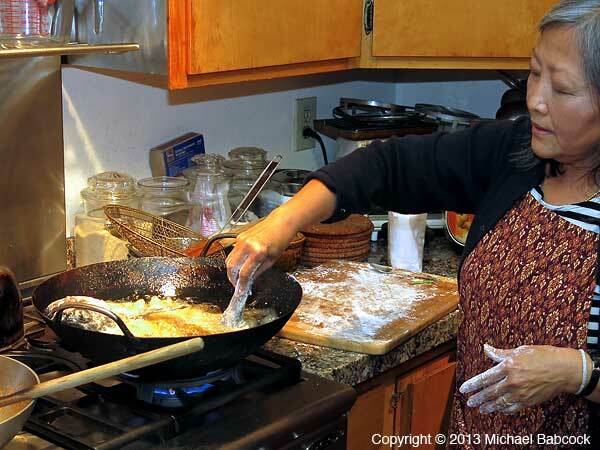 She explains that if you fry the noodles dry, they puff up more, which is undesirable in this recipe. As always, she shows the students the best brand available locally to use. 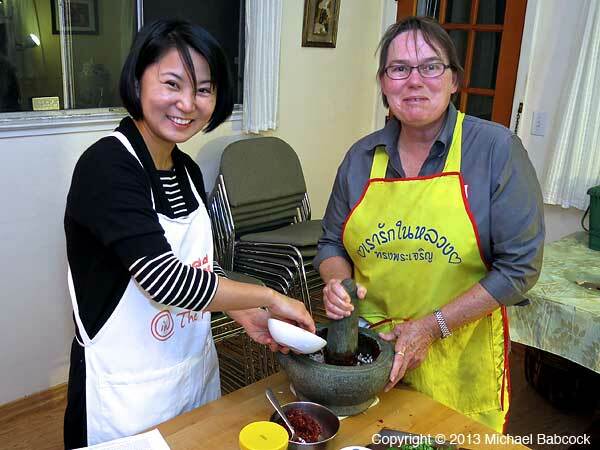 The first intermediate class introduces two ingredients that are new to the students. 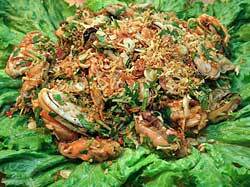 Pickled garlic is used in the Crispy Fried Noodles and crispy fried shallots are used in the Spicy Mussel Salad. 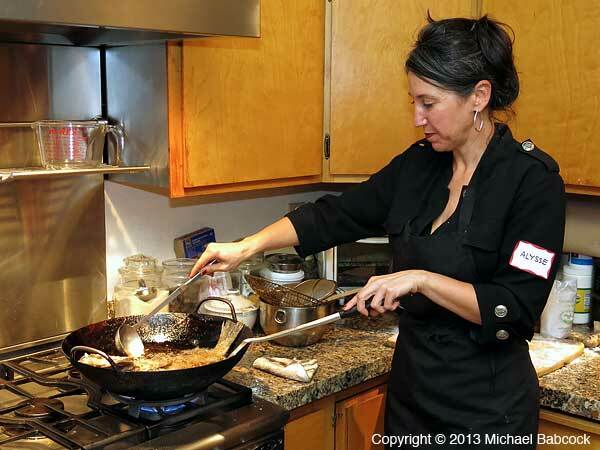 Kasma talks about what to look for when buying these ingredients, what brand of the fried shallots (often labelled “Fried Onions”) are best (see Kasma’s Favorite Brands) and how to make your own crispy shallots, should you be so inclined. 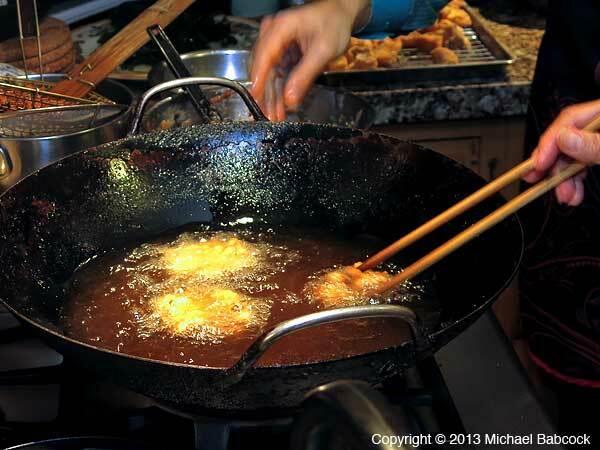 This class introduces methods for deep frying, both for the Mee Krob – Glazed Crispy Noodles – and for the Pla Rad Prik – Crispy Fried Whole Fish Topped with Chilli-Tamarind Sauce. 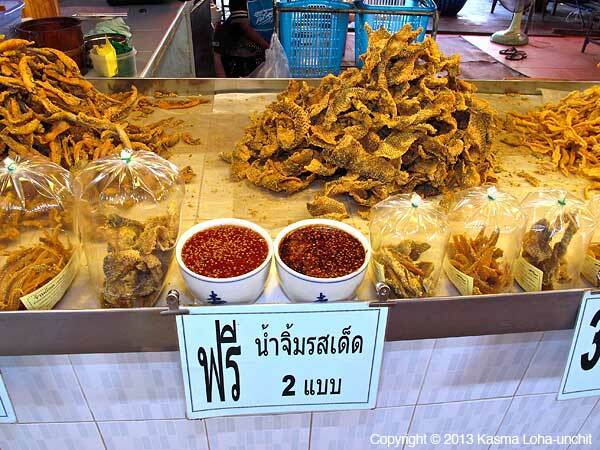 I have long been an admirer of the way that Thais fry things: the fried foods in Thailand seldom taste greasy at all and their fried fish is always fried to a delightfully crispy and crunchy state that is both fun to eat and allows you to eat most of the fish. This class also has deep-fried noodles, also well-fried and not very greasy. 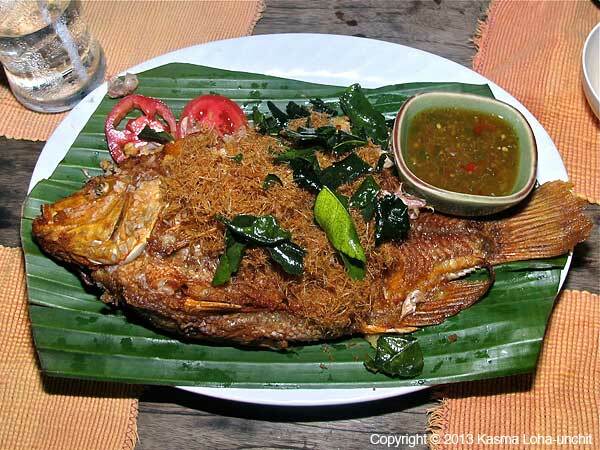 So I was somewhat startled to read in a cookbook by a famous Thai chef that “. . .Thais are not particularly good at deep-frying, opting to cook any piece of meat as much as possible – even fish.” He claims this comes from fear of worms from fresh-water fish. 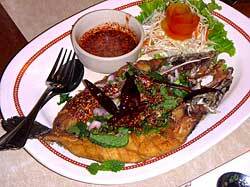 All the Thai people I know love crispy-fried fish: they cook it that way because they like it that way – they like the texture, it is non-greasy, it tastes good and eats well. I guess he’s never been to the North or the Northeast where they like to eat raw meat salads – odd behavior if they’re afraid of parasites. 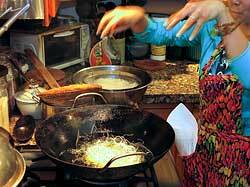 Kasma fries her fish in her trusty 16-inch round-bottomed spun-steel wok: it’s the perfect piece of cookware for deep-frying. 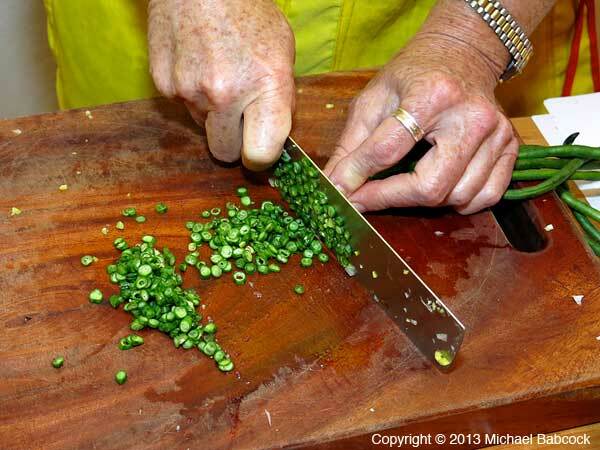 This is a great class for students who are afraid to fry – Kasma shows how to do it easily and safely. 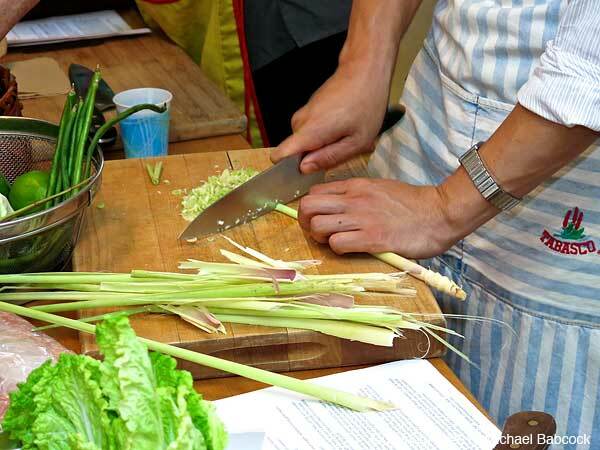 As with all classes, Kasma tells the students which local markets typically carry any specialty ingredients, such as fresh, whole fish (not readily available in most western supermarkets) or garlic chives (used in the Crispy Fried Noodles. 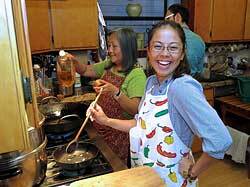 She goes into which recipes can be prepared ahead of time and which parts of recipes can be done in advance to make the final assembly easier without losing and freshness or flavor. 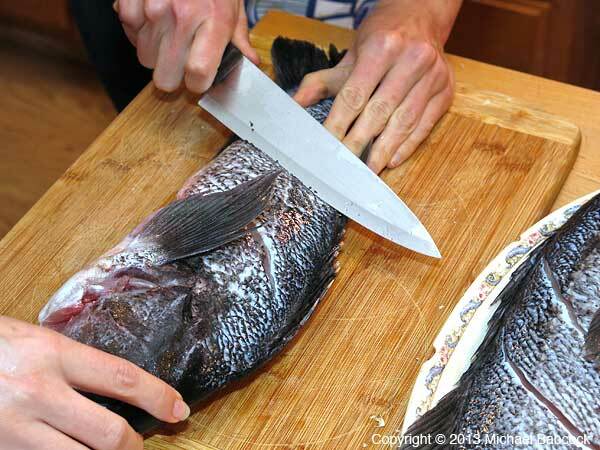 In this class Kasma also goes over how to pick out a fresh, whole fish; it is something that many students have never done or even considered doing before. She gives 5 pointers (such as looking at the over-all luster of the fish and how the eyes and gills should appear) that will help even the novice choose a fresh fish. 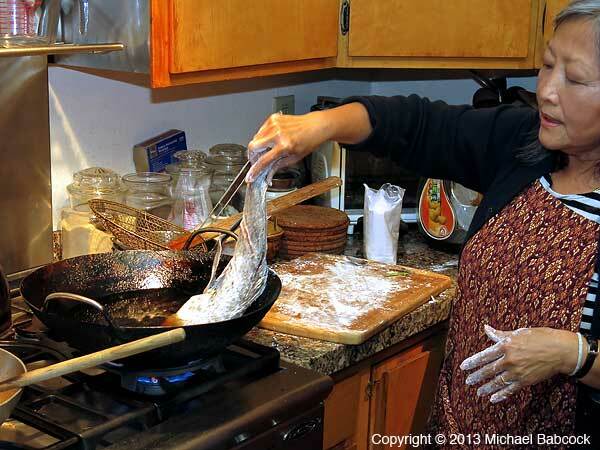 You can read Kasma’s article Selecting a Fresh Fish, excerpted from her Dancing Shrimp cookbook. After the recipes are explained, the students divide up into groups: Kasma assigns a certain number of people for each recipe. Once the ingredients are prepped, all the students watch the members of the team do the cooking. 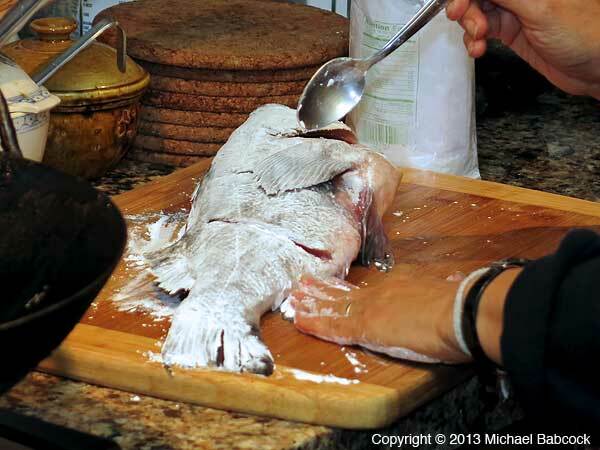 When appropriate, as in frying a whole fish, Kasma starts the cooking process so that she can show how a particular technique is done: after that, the team members do the cooking. Kasma also oversees the final balancing process for the recipes: one of the great strengths of her classes is learning how the various ingredients interact to create a harmony of Thai flavors. Of course, the best part of the evening is sitting down to eat a Thai feast at the end of class. Eating dinner, the best part of class! After dinner, everyone helps clean up before going home. This is a noodle dish that is almost always too sweet at the local Thai restaurants. Kasma’s version is crispy, not greasy at all (despite the deep-fried noodles) and flavorful, with just a hint of sweetness. 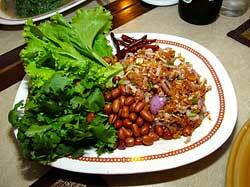 It could almost be called a fried salad, served as it is with bean sprouts and garlic chives. 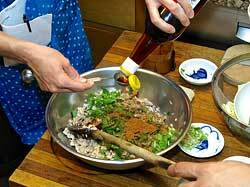 It’s a dish that must be eaten within an hour of cooking, otherwise it will turn somewhat soggy and uninteresting. 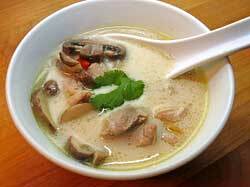 This is one of two soups that is found at virtually every Thai restaurant outside of Thailand. (The other is Hot & Sour Prawn Soup – Tom Yum Goong.) This, also, is a dish that I’ve been disappointed in when ordering out in the U.S. – too sweet, too rich: Kasma’s version is somewhat lighter with a bit of sour flavor. I once read a Westerner who claimed that this soup was just “Tom Yum Soup with Coconut.” This is absolutely not true. The main herbal flavor in a Tom Ka soup is galanga, with lemon grass in the supporting capacity: with Tom Yum soups, it’s just the opposite – the galanga supports the lemongrass. 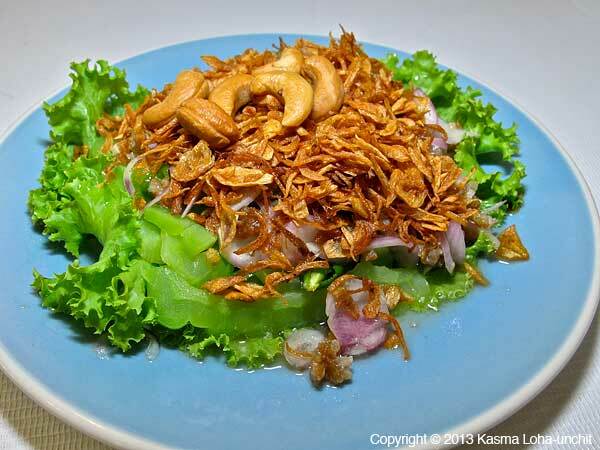 This is a recipe that is very common in Thailand: on Kasma’s trips we’ll usually eat it at least a couple of times. 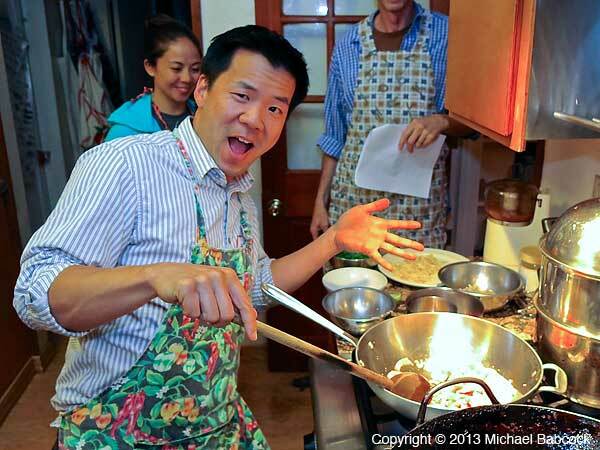 I was so excited the first time I made this dish by myself (after I first took the Intermediate Series in 1992) – it looked just like the dishes in Thailand! However, in Thailand I often find it too sweet for my taste: in Kasma’s version the sauce is equally sour and salty with the sweetness (from palm sugar) in the background. The best parts to eat of the fish are the crispy-crunchy parts. My personal favorite is the head: it’s full of interesting crunchy bits interspersed with softer textures. Before I met Kasma I would never have eaten a fish head: now I usually join this class at meal time because often no one in class knows how to eat the head – I like to help out. 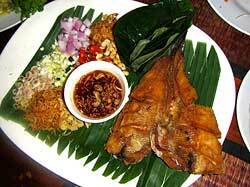 Fish and seafood are an integral and important part of the Thai diet. See Kasma’s article The Thai Fish-Eating Tradition. 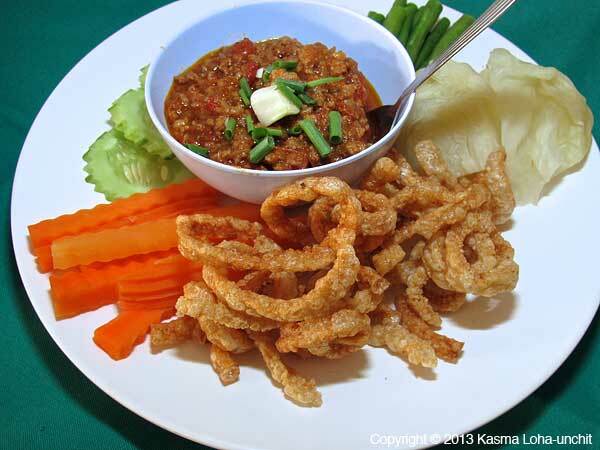 This dish is also an opportunity for Kasma to discuss the use of chillies in recipes. 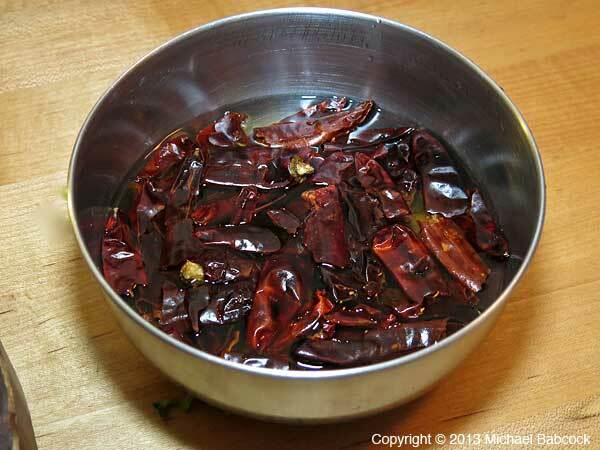 At the time of the year of this class (April), many of the chillies we get here in the San Francisco Bay Area come from South or Central America; because of the climate, they tend to be very hot. As chillies grown in California become available, the number of chillies may need to be adjusted: initially, the local chillies will be much milder. This is the sort of information that you get in Kasma’s classes: you’ll not commonly find it in Thai cookbooks, which usually give a specific number of chillies in a dish without going into how you may need to modify that number to get the level of heat the dish (or your tastebuds) require. Details – times, policies, etc.